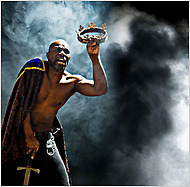 John Douglas Thompson will play the title role in Shakespeare’s “Richard III” in the Shakespeare & Company production in Lenox, Mass., beginning July 2. Next Article in Theater (8 of 27) » A version of this article appeared in print on May 9, 2010, on page AR21 of the New York edition. Nice to see that the NY times chose to use my shot of John Douglas Thompson to lead off their article on summer theater across the nation! Too bad they missed the photo credit…. no matter how hard you try. The best part about the image was the coincidence of timing – shooting RIchard III and trying to work in the disfigured quality of the character – I woke up with a nasty back spasm that day and could barely stay on my feet for the shoot!